America shined in Rio’s spotlight, so why not celebrate with a costume commemorating your favorite Olympic athlete? Dress-up options abound for guys and girls. Add a swim cap for a pool-worthy get-up, or round up four friends to dress up as the Final Five. Dig out a medal from your competitive sports days (or make one yourself), throw on some sweats or patriotic workout garb, grab a bouquet of blooms and pretend you’re on the podium. Who ya gonna call this Halloween? Ghostbusters returned to the big screen this year and brought some serious girl power with it. You can go as a lone ghostbuster or grab a group of friends to hit the town. Don’t forget your proton pack! Creating a ghostbuster costume is simple: Khaki Pants. Black boots. Belt. Backpack. Orange and yellow duct tape. You’re ready to answer the call! Alright Halloween fans – it’s almost GO time. Get ready to catch all the tricks, not treats, with an easy DIY Pikachu costume. Bring a friend along for the fun – the costume for Ash is even easier! The donut float may have ruled the pool last year, but 2016 was the year of the flamingo and the swan. Float into fall with a pool-party themed Halloween getup. Whether your costume includes the actual float, or just a water bird-themed outfit, you’ll be ready to fla-mingle at any Halloween party. Tip: Tie pink or white balloons to a belt to make a “float” you won’t have to hold up all night. Unbreakable Kimmy Schmidt is taking Netflix (and our hearts) by storm. Emulating her look for Halloween is easy! Re-create Kimmy’s signature look with colored denim, a floral button-down, a yellow sweater, and a backpack. Kimmy always sports the middle part with loose waves. Red hair is a bonus! They’ve been around since long before 2016, but does using emojis ever get old? If you follow Glamour Shots on Instagram, you’ll know they’re our preferred method of communication. Lucky for us, emojis make easy (and fun) Halloween costumes. The emoij possibilities are almost endless. Yellow face paint can give you a base for just about any face emoji, and from there, just pick your favorite one! Add sunglasses, cat ears, red hearts around the eyes, or big glasses and a toothy grin. An emoji assortment is the perfect costume idea for a large group! Jojo’s search for love kept us captivated this summer, so we’d like to accept the rose for a bachelorette-inspired Halloween costume. A sparkly gown, giant (fake) bling, and of course, a rose, are all you need. Some of our favorite ocean residents came back to the big screen in 2016. 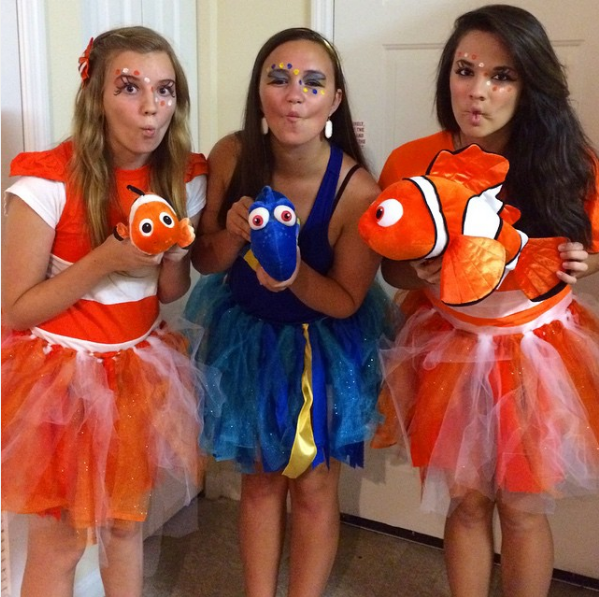 Both Nemo and Dory make for creative Halloween costumes, especially if you’re not afraid of color. Bring out the bright tones with colorful outfits and a DIY tulle “fin” skirt. Go crazy with the blue eyeshadow. Or, if you’d prefer a more toned-down aqua shadow look, refer back to our summer makeup tutorial. We want to see your Halloween creations! Tag us on Instagram using #glamourshots. And if you just want to dress up as the best version of yourself, book an appointment today for your own Glamour Shots Experience. Follow Glamour Shots on Pinterest for more Halloween costume ideas.